New home across the street from private beach offers ocean views from every room. 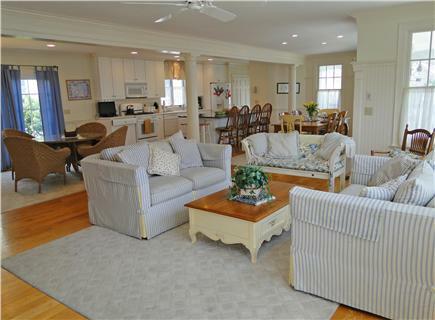 The Popponesset Inn, Market Place, and beach are just a short stroll from this luxurious four bedroom, five and half bath beach house. Open floor plan with oversized kitchen island and outdoor patio are great for entertaining friends and family. 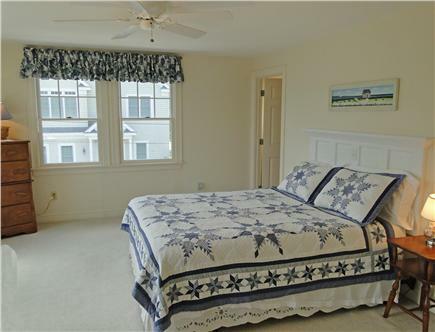 Home offers second floor master bedroom with king size bed, luxurious bathroom, large walk-in closet and balcony over looking Nantucket Sound. The first floor bedroom has a California king size bed, attached bathroom, and walk-in closet; the third bedroom has a queen size bed, attached bathroom, and walk-in closet; the fourth bedroom has a queen size bed, a twin bed, and is across the hall from its own private full bathroom. 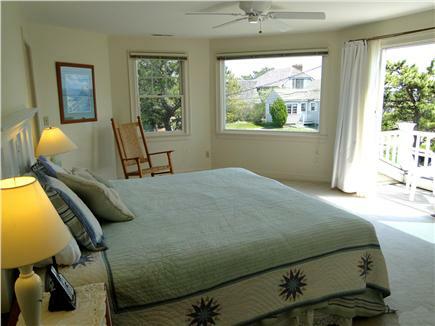 A well lit bonus room in basement has a pull out queen sofa bed, and adjacent bathroom. 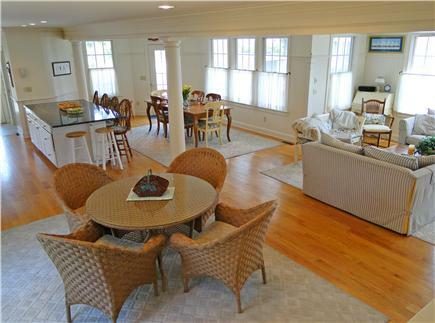 Home comes with air conditioning, washer and dryer, wireless internet, gas log fire place, beach chairs, and gas grill. Home is equiped with a computer, cable internet access, and wireless router; beach chairs; and all linens and bath towels. Additional pricing info: Refundable Security Deposit = $1000.00, State and local taxes of 12.45% will apply. Perfect vacation home, in a perfect location! We have lived in Boston and vacationed on the Cape for the past 20+ years. Approximately 12 years ago, we found this perfect home on the Cape, and since this time, we have spent several weeks here EVERY SUMMER. **5 Star Location - Amazing, quiet cull-de-sac, located a few blocks from the Poppy marketplace and center. 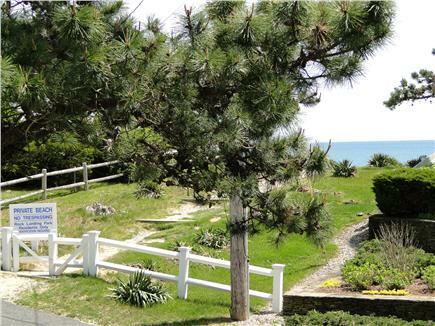 The property is also across the street, and has access to a private beach. Anyone who knows this area knows how rare it is to have access to a private beach. **5 Star The Property - A wonderfully appointed home, with a great, open, floor plan, and plenty of seating for family and guests. In addition, EVERY room in this home has a view of the ocean. 1. 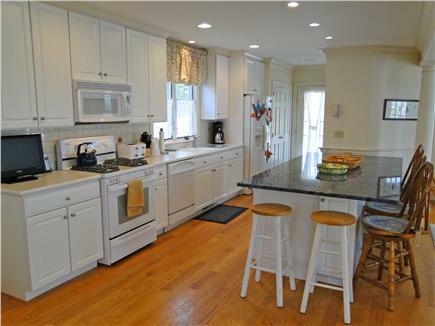 The kitchen is a cook's kitchen with an amazing amount of prep, cooking, and counter space. The open floor plan allows you to comfortably seat 10 at a large kitchen island, and even 10 more in the open dining area. 2. The adjacent outdoor dining area has a great bbq, and another large seating area, outdoor dining table, and fantastic ocean views. 3. All of the bedrooms are large, spacious, have comfortable beds, and large closets with plenty of storage space. 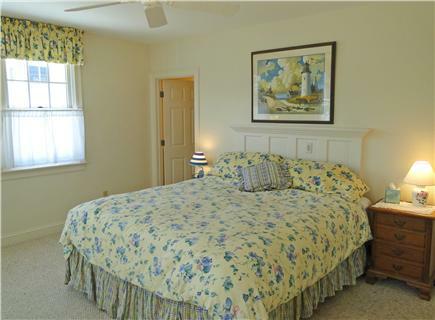 Also, almost all of the bedrooms, have their own private bathrooms. 4. The basement is a great attraction for teen+ crowd. There is a big TV area, game room area, and additional full bathroom. Having a nice washer and dryer there makes it easy to keep all of your items clean, and centrally located. 5. The property is always immaculately maintained and in pristine condition. Clearly this is a loved family home, and every year we have stayed there, it has always been impeccably maintained. ** 5 Star Owners - Owners are responsible, responsive, and generous. In addition, the owners are incredibly generous with any item that they leave at the house. They have a nice supply of: beach chairs, toys, towels, games, bikes, a computer, etc.. stored in the basement area, and welcome guests to use them. This is so nice and makes it so much easier to travel to a summer place, when you know you do not need to haul all that stuff to a vacation place, and then haul it, and all the sand back home. We rented this incredible home in April of 2012 for my son's wedding at the Popponesset Inn. The rooms are grand in size and beautifully appointed. The location is perfect, right across from the beach, and the area is quiet with a friendly neighborhood vibe--even during the off-season. Would love a reason to go back.